My last two reads. This is the third time I've read Kitchen, by Banana Yoshimoto, and each time, I've been mourning someone or something. Each time I get something new, and deep, from the book. It's a very special book. Very zen, in a way. 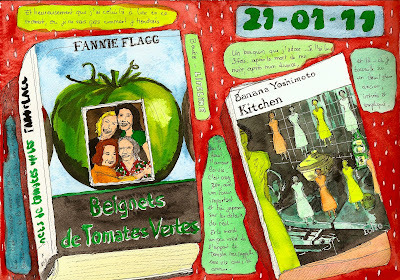 The other one is Fried green tomatoes by Fannie Flagg. Second time I read it and second time I love it. I found it darker this time. Funny how we get things differently as we age and go through new experiences. Both are great books to read when you need to get through some tough times, anyway, to me they are. I like your book sketches. I looked up Kitchen on Amazon but its only available from other people since its out of print. Perhaps I'll check the library. Your cat is cut. I'll bet it's a fluffy Persian kitty. I think your people look good. Better than I can do. Keep up the good work. Did you ever find a new place to live? The covers are fantastic Kazumi! =) And the faces, I must say, everytime you do faces you really surprise me. I am talking about the improvement and the emotions you portrayed in them... and of course, who doesn't love cats? =) That one is so cute! 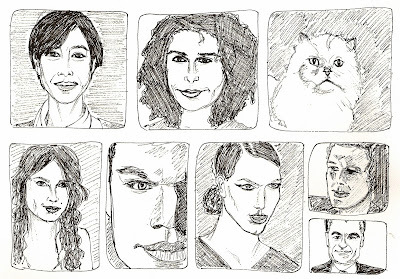 Your faces are good and I even recognize some of them. Lovely red and happy drawing of the 2 books. I think I will re-read Fried Green Tomatoes. I looked up Banana Yoshimoto because I had never heard of her. I have put 'Kitchen' on my reading list. Thanks for giving great drawings as well as book-ideas. 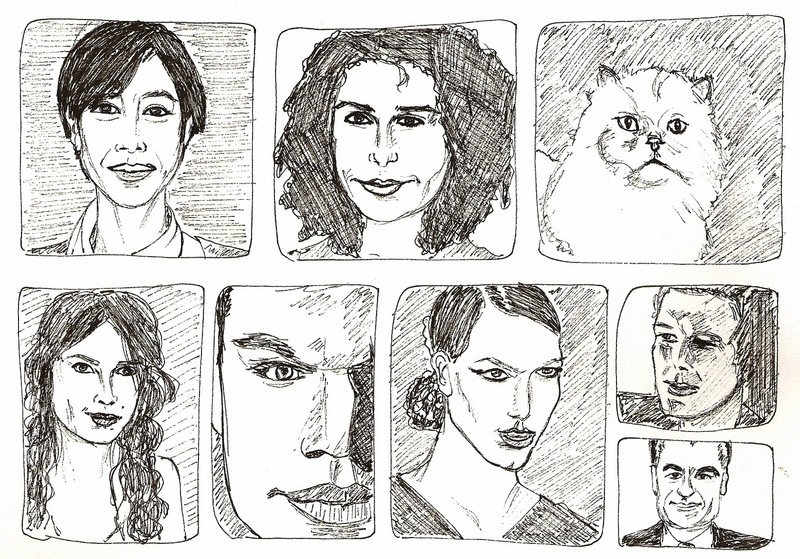 I think your faces are very well done. I like the way you give them each a frame and organize them on the page. I have been practicing faces too, and may use your layout idea, if you don't mind. 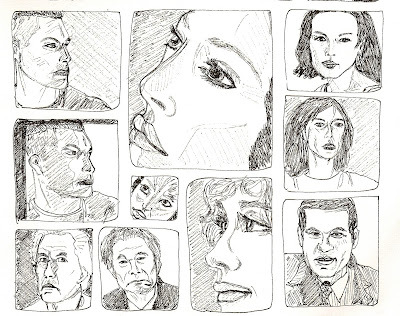 Your face sketches are very good, you get the features and character right! I always enjoy the soul you put into your drawings. You use color so well and your black and white line drawings are superb! I think you are simply wonderful. I LOVED the Fried Green Tomato movie, so Southern.. never read the book, maybe I should. Fantastic! Always love your books; they seem like your 'signature'. I'd recognize them as yours anywhere! 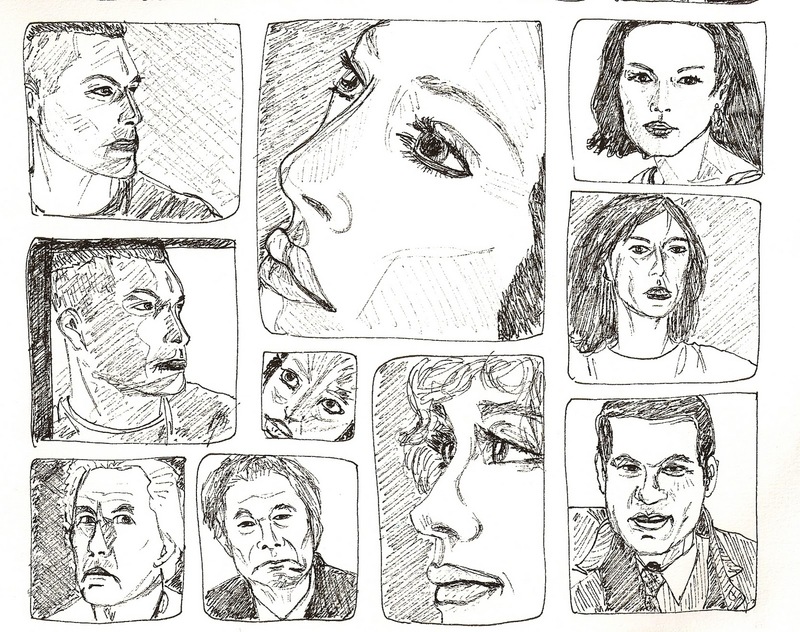 And the faces are wonderful; I really like the top left of the bottom page. I don't recognize them, but that isn't surprising really. I don't pay much attention to Hollywood or get any magazines! Amazing books and the faces, WOW!! Wonderful series! I read the Flagg book as a teen, then later as a 20something and found it to be quite different the second time around.